Time to detox your home? We think so! Don’t get yourself in a flutter over clutter – sell the stuff that you no longer need online with We Buy Books. A clutter-free home feels good and looks great so do yourself a favour and have a clear out. Most of us have one – a tower of DVDs! But, out of all those 100’s of DVDs, how many do you actually watch? If the answer is not many, then we’d say it’s time to have a good look through your collection and see which DVDs you wouldn’t miss if they were gone. If you have a few binge-worthy box sets that you finished months ago and haven’t touched since then sell them online to make some money from them. Pretty much everyone enjoys a duvet day so if you don’t want your box sets, then the odds are someone else will. Breaking Bad, Peaky Blinders and Stranger Things are just a few of the shows that are BIG right now. Less is more, right? Slim down your book collection so that you can find the books on your shelf that you love in seconds, not hours (or days). Only keep the copies that you really want, need or use. If you’re a graduate and your bookshelf is full of old textbooks then are you really going to ever flick through them again? Probably not, eh? If you have books that haven’t been read in years then it’s unlikely that you’d miss them if they were gone. 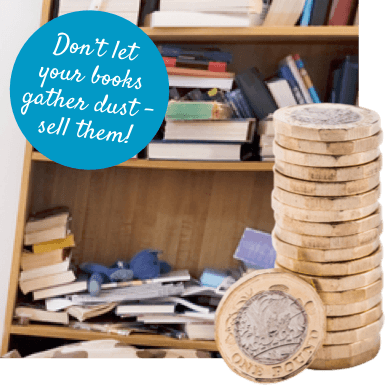 Don’t let them gather dust – sell them! Is the glove compartment in your car home to 1000’s of CDs? If it is, then it’s time for a clear out! CDs can soon clutter up your home and car. Be honest, how many of your CDs do you actually listen to? Fish out your favourites and sell the rest to make some money. You can buy some new CDs from your favourite artists with the money you make from your old CDs. What’s not to love about that? 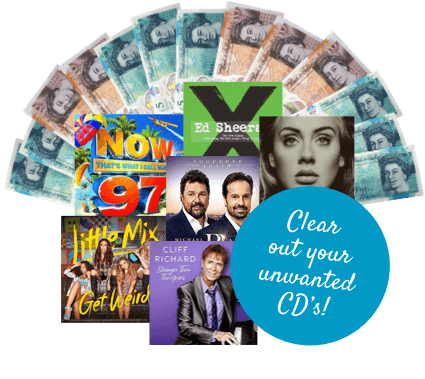 We’ll take your unwanted CDs off your hands and we’ll give you some dosh. De-clutter, detox your home and de-stress. Sell your unwanted books, CDs, DVDs or video games online with WeBuyBooks. LIKE us on Facebook and FOLLOW us on Twitter for giveaways, voucher codes and more!